Following their father's gruesome murder in a violent home invasion, the Locke children return to his childhood home of Keyhouse in secluded Lovecraft, Massachusetts. Their mother, Nina, is too trapped in her grief—and a wine bottle—to notice that all in Keyhouse is not what it seems: too many locked doors, too many unanswered questions. Older kids Tyler and Kinsey aren't much better. But not youngest son Bode, who quickly finds a new friend living in an empty well and a new toy, a key, that offers hours of spirited entertainment. But again, all at Keyhouse is not what it seems, and not all doors are meant to be opened. Soon, horrors old and new, real and imagined, will come ravening after the Lockes and the secrets their family holds. Named a "modern masterpiece" by The A.V. 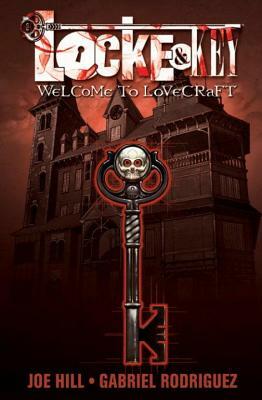 Club, Locke & Key tells a sprawling tale of magic and family, legacy and grief, good and evil. Acclaimed suspense novelist and New York Times best-selling author Joe Hill (The Fireman, Heart-Shaped Box) has created a gripping story of dark fantasy and wonder—with astounding artwork from Gabriel Rodriguez—that, like the doors of Keyhouse, will transform all who open it. The epic begins here: Welcome to Lovecraft. Locke & Key, Vol. 1 features an introduction by Robert Crais. Joseph Hillstrom King, better known by the pen name Joe Hill, is an American author and comic book writer. He has published four novels—Heart-Shaped Box, Horns, NOS4A2 and The Fireman—and a collection of short stories titled 20th Century Ghosts. He is also the author of the comic book series Locke & Key. He is the son of authors Stephen and Tabitha King.